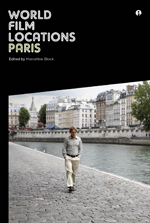 As Keith Reader explains in the opening essay to Intellect’s World Film Locations: Paris, the cinematic Paris is not one of monuments, but of flânerie. Like Baudelaire and Walter Benjamin strolling the arcades, the shots float along cobbled streets, through cafes and across parks. Paris was where location shooting became, in the 1960’s, representative of the free, youthful spirit of the Nouvelle Vague. And it is, like New York, a place so frequently filmed that one recognises it at first sight, a place both foreign and familiar, a place of streets that shimmer with a disquieting feeling of déjà vu. What sets this slim volume apart from other city focused cinema books is that each entry presents a scene that takes place in a specific location. The book is split into chronological sections, beginning with Jean Renoir’s 1932 Boudu Saved from Drowning (Boudu Sauvé Des Eaux) and ending in 2011 with Midnight in Paris (Woody Allen). Each section opens with a map marking the locations of each scene. It is, in a way, a city guide for the cinephile. In The Practice of Everyday Life, Michel de Certeau defines the difference between a place – a fixed address, and a space – place as navigated according to direction, time and speed. Thus, he concludes, “space is a practiced place.” This book presents a series of cinematic moments where locations are practiced, transforming from points on a map into spaces that are influenced by the dramatic action and, in turn, exert the influence of their presence onto the characters. With the exception of La Jetée (Chris Marker, 1962) and Chronique d’un Été (Edgar Morin and Jean Rouch, 1961) the included scenes are set within the périphérique. This discounts some recent films set in the suburbs, for example, Claire Denis’ exquisite 35 Rhums, but a brief guide to Denis’ Paris is included by way of a short essay on her work. These spotlight articles, dotted between locations, introduce a filmmaker or element of Parisian cinema in a little more depth. Particularly fascinating is Françoise Praff’s short history of Francophone African Films. Describing a diverse mix of pictures, Praff highlights the complex image of the black French speaker. Many of these directors, she writes, subvert the traditional cinematic view of Paris as a city of romance, instead showing it as a lived city – one that can be unwelcoming and rough, where people struggle to find work, where they are lonely, desperate and sometimes deported. The films profiled are a mix of independent and commercial, French and foreign. The book doesn’t explain how or why films were chosen. I notice the absence of Maurice Pialat’s À Nos Amours (1983), but everyone will have their own list of films they would have included. Reader, noting there are fewer films featuring the students of the Left Bank than one might imagine, claims, “The events of May 1968 yielded no major film.” But regardless of whether or not one calls Philippe Garrel’s Les Amants Réguliers (2004) ‘major,’ I wondered that it wasn’t mentioned at all. But this is an introductory guide, and it feels churlish to expect it to be anything more. There are some wonderful moments. Jean Rouch’s long hand-held shot outside the Renault factory in Chronique d’un Été, a film that I’ve only ever seen sections of and am desperate to see in full. The melancholy Le Ballon Rouge (Albert Lamorisse, 1956) which I loved as a child, and its descendent, The Flight of the Red Balloon (Hou Hsiao-hsien, 2007) where a young Chinese filmmaker works as a nanny while making a remake of Lamorisse’s original. The scene when the American GI Turner (Harry Baird), awkward and alone in a foreign city, plays catch with a child in the Jardin des Tuileries in Melvin Van Peebles first feature, The Story of a Three-Day Pass (1968). The only real reservation I have about this book is that the texts themselves are a little dry. In a book full of precious moments, glimpses that ought to make you want to watch the films, some of the blurbs lack magic. This is not a rigorous academic study, so the aim must be to persuade you to watch the films in it. A little poetry wouldn’t go astray. That said, this series gathers together a wonderful collection of cinematic moments that rise up out of the city and re-inscribe it with new ways of seeing. Forget Paris? I think not. Michel de Certeau, The Practice of Everyday Life, (Berkeley: University of California Press, 1984) 117.